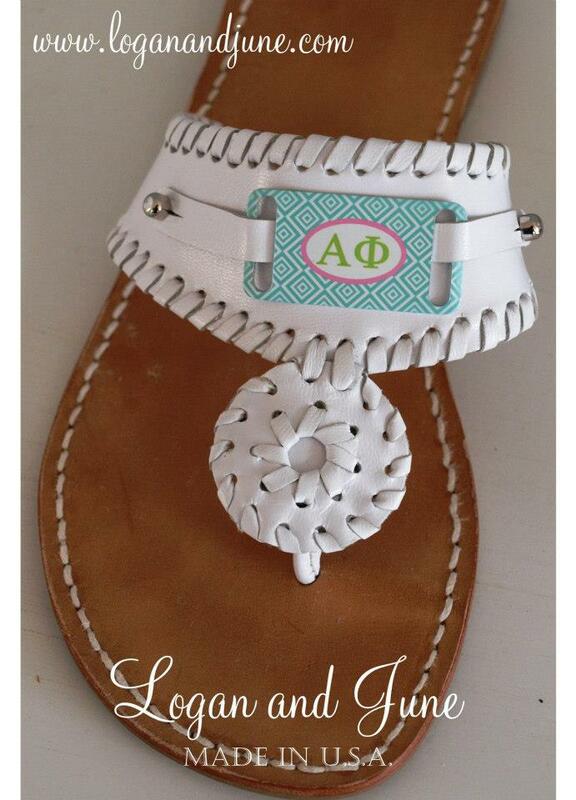 Clemson Girl: Win a pair of customized sandals from Logan and June! 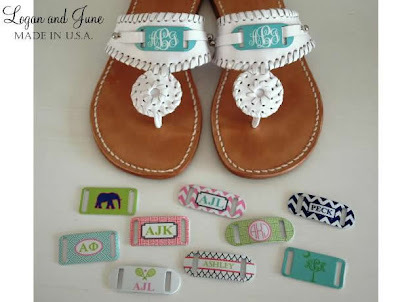 Win a pair of customized sandals from Logan and June! Good morning Clemson Girls! If you're like me, you are probably still reeling from yesterday's news about Howard's Rock. How about some good news and something fabulous to get your mind off of it? Clemson Girls... we have an amazing giveaway today from a brand new company, Logan and June. Logan and June sells a very special type of sandal - you see, you can customize the sandal with their special slide tags that you get to customize yourself. From monograms to names to preppy images and designs, you can create a unique style all your own. 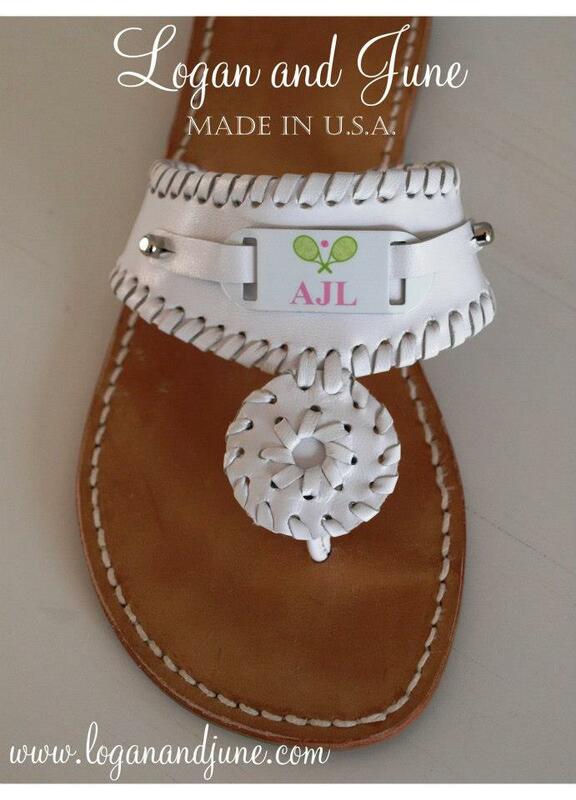 The sandals are available in women's sizes 5 to 11, and both the tags and the sandals are proudly American made. And what's great about these sandals and slide tags is you can slide one off and put another on for a completely different look. The slide tags can also be used in other ways in addition to the sandals. Put them on Logan and June's special bracelets. Keep the tag the same, but change the bracelet so you can wear your tag with any outfit. And how cute is this? 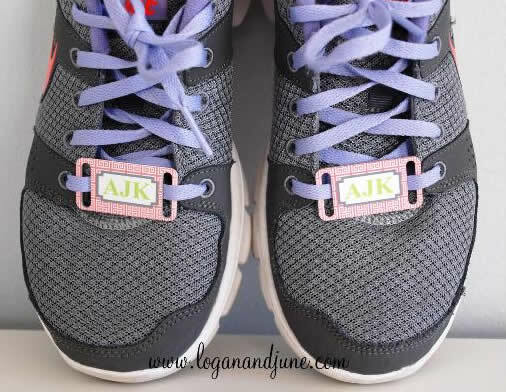 You can even use your tags on your tennis shoes! Love! But do they come in orange and purple, you ask? Of course! Check out these cute Clemson designs created just for Clemson Girl by Logan and June. Logan and June have generously offered to give one very lucky Clemson Girl a pair of their Logan and June sandals and two slide tags that the winner gets to customize! This is a prize valued at $129. Deadline for all entries is MIDNIGHT Friday, June 14. We will draw a winner at random on Saturday, June 15 and contact the winner by email. The winner will have 48 hours to respond to our email or we will draw a new winner. Special thanks to Logan and June for sponsoring today's giveaway and cheering us Clemson Girls up! Best of luck Clemson Girls! With my monogram in Clemson colors, of course!!!! These are adorable and I would love to win!!! I would have one for game day and one for everyday wear! These are adorable, so glad to now know about them. Would have to get the Clemson colors! Too cute! I would love purple with orange monogram or the other way around! SO cute! I would do one for Clemson and one i could wear anytime! GO TIGERS! I am a southern girl at heart. I was born and raised in South Carolina. Because of this background, I love all the traditions that a southern girl stands for. Pearls, jack rogers, and monograms are a few of my favorites. Not to forget, being a true Clemson Tiger is one to put on my favorite list. Because of all of these passions and interests, I would love to support Logan and June by wearing and sharing their name on my feet! These shoes are to die for, and I would love to get customized sandals with my monogram while sporting my tiger pride in purple and orange! Oh my goodness! I do love these! Would love to win these!!!! I would wear these every day on campus! LOVE. In LOVE!!!! So stinking adorable!!!! I would consider myself a lucky girl if I won these!! Fingers crossed hoping to win! There are so many options I would have to take my time to decide - definitely something for everyday! I love that they come in Clemson colors! I really love the script monogram with the South Carolina state tree. I think I would do it in either turquoise or Clemson orange. I'd love to have a little piece of home during my stay in Louisiana!!! Love these! Perfect for summer!! 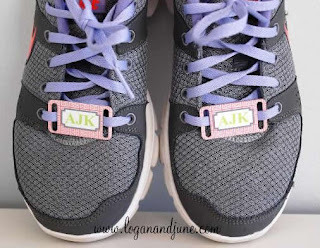 So great, I'd put my monogram on them! I love the classic monogram--definitely in a Clemson color combo! Palmetto tree is preshhhhhhh!! Love it!! so chic!!! I would do my monogram in orange on a teal or purple background!! I teach at a huge football-lovin' high school. I would use the school colors to create my monogram that would be in school spirit for the Rebels. I love this idea for girly shoes. I would love the orange and purple! What a great way to accessorize during football season! Orange and Purple monogram, and then the Palmetto tree! So many choices but I would definitely choose a game day option! I love the sky blue with white script. So pretty! So cute! These are perfect for the summer and showing some school pride! Love Love Love! 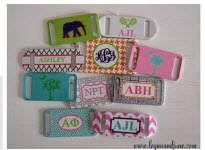 I would customize these with a cute chevron monogram!